The official launch for the New York Film Festival begins on September 26 with the world premiere of David Fincher's Gone Girl. They're in luck; the early reviews are raves. And the critic screenings are in overdrive with three or four movies playing during the day for over a week now. So there's a lot to catch up on and a lot to see. Here are two very good documentaries and two dramas. Only one may be truly great at first blush but they're all worthwhile in one way or another. 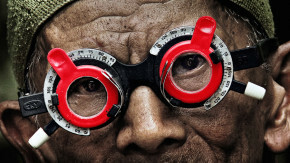 Director Joshua Oppenheimer's Oscar-nominated film The Act Of Killing is one of the brashest, strangest, downright surreal films of recent years. It looks at the bizarre and unsettling facts of Indonesia, where under cover of the fight against communism a massive genocide took place in the 1960s. The people who committed it are still in power, still living among the survivors of the people they brutally slaughtered. The PBS series POV is airing the film on October 6 and it's not to be missed. What makes the film so strange? Well, Oppenheimer met with the people who committed these crimes against humanity and somehow got them to reenact their murderous actions...in the style of various movie genres. This doesn't begin to accurately capture the rare mood of the film, which is funny and horrifying. It's no surprise that Errol Morris and Werner Herzog championed it; they love breaking the rules in their documentaries as well. Now comes a companion piece, The Look Of Silence. It is in many ways the polar opposite of the first. No gimmicks, no tricks, no high concept framing to coax people into documenting their own crimes. It simply shows the brother of one man who was slaughtered quietly talking to and sometimes confronting the many, many people in power who are responsible for murder. One of my (many) pet peeves is describing this actor or that director as "brave." There's nothing brave about playing a part on stage or in a movie, no matter how audacious. Save "brave" for people who genuinely risk their lives for others, like cops and firemen and soldiers and the like. But genuine courage is the only way to describe the father who takes center stage in this work. Oppenheimer's earlier film documented who killed his brother and how. In this movie, the man literally risks his life to confront the people -- including an uncle -- who did this. The title comes from the way he can ask a question and then simply sit and stare as their absurd, insulting, petty, dismissive or disingenuous answers fall to the ground, unworthy of comment. Some crumple under his quiet bearing of witness; others literally threaten his life. A young woman hears her elderly father describe drinking the blood of the people he slaughtered (in order to not go crazy, others explain, in a superstitious response to the evil they were perpetrating). She begs forgiveness. Others stonily refuse to admit the obvious. It's an unnerving, potent, remarkable work. And it's no joke: many of the technical credits on the film say simply Anonymous, a potent reminder of how very dangerous this truly brave act was. It's not just a brave act; it's also a genuine work of art. Surely at the beginning of every audience Q&A, at every press conference, the first question will be: has this man been killed? One of the best films of the year, The Look Of Silence is a startlingly different but just as potent companion piece to one of the best documentaries in a long time. Here's the trailer for The Act Of Killing, which airs on PBS October 6. Ethan Hawke is becoming rather annoying. He's been an acclaimed actor on stage and screen for many years. He's written novels. Then he took up journalism and delivered a great profile of Kris Kristofferson for Rolling Stone. Now he's starring in Boyhood, one of the most acclaimed films of the year and a genuine indie hit. To top it off, he's making his debut as a documentary filmmaker with this sweet valentine to Seymour Bernstein, a beloved music teacher. They met at a dinner party a few years ago with Hawke immediately opening up about his almost crippling stage fright and self-doubts about whether what he did had any worth. Bernstein was an ideal sounding board: he'd quit his brilliant public career as a pianist and devoted himself to teaching and composing. Bernstein's philosophy is that practice of any craft, any talent, makes you better at your craft and better as a person. He turned his back on the treadmill of fame and perhaps feels it's mostly destructive. But fear is ok, even essential. Doubt is ok. And the doing of it, the working at your talent is essential. So indeed, is creating and not just recreating. (A pianist who plays a piece by Bach is "recreating." A pianist who composes his own work is "creating." One is not worthier than the other but Bernstein feels strongly that artists should create. Hawke, as a writer and director and producer sometimes beleaguered for having the temerity to do so (much like james Franco is today) surely was sympathetic to this. Plus Bernstein was so delightful, so full of life, so happy in his calling as a teacher. Why didn't someone make a movie about him? Why indeed? So Hawke did. The film is quietly bold. It's a profile of Bernstein. But it also documents his philosophy of life and Hawke's struggles are a modest subplot. This makes it a little shaggy, especially when it climaxes with what should be the cheap sentimentality of a public performance: Bernstein gives a benefit concert for the theater company Hawke helped found. But this becomes the film's masterstroke since Hawke intercuts footage of Bernstein practicing the piece and performing the piece, symbolizing the man's approach to life with one bold stroke. Not since To Be And To Have has a teacher been shown in such a disarming way; you want to immediately sit in on one of Bernstein's classes. Or at least buy some of his music. (A brief search turned up nothing officially in print.) Hopefully a soundtrack won't be far behind this charming work. Film festivals can play a vital role for some filmmakers. They may not achieve international success at first. But a festival that believes in a talent can keep championing their work, telling critics to pay attention. I was not enamored with Mia Hansen-Love's debut Father Of My Children. So I skipped her similar seeming second feature. But here she is again with a new movie. It's radically different in nature from her earlier work and the buzz is good so here I am. Indeed, Eden is very different from her small-scale dramas, though it surely is linked in theme and other subtler ways. On the surface, it's about raves and DJs, tracing the career of one talented young artist from fan to deejay to a name big enough to travel the world a bit and rub shoulders with the likes of Daft Punk. it's not about fame and disillusionment, however. This isn't the life of an artist, as such. Eden rather interestingly shows passion -- in this case, for garage music -- turning into a job. And a young man slowly realizes that the joy of his youth isn't going to be enough to sustain him for the rest of his life. What next? It roams over many years but has a light touch. Since the film isn't truly interested in deejays as an art form, we don't spend much time at all learning how they do what they do, to say the least. Our hero Paul (the handsome Felix de Givry) is seen more often being hapless in love than working at his craft. (Seymour would have something to say about that.) The rave scenes are pretty but never quite get under your skin; you can see people reacting to the music and the deejays dancing in ecstasy but it's all at a slight remove. Perhaps because they know eventually the party will end. That remove is probably the film's biggest strength. They're not making a grand statement about raves, how even the most rebellious art forms become co-opted. They're not examining the scourge of drugs. They're not romanticizing or criticizing youthful passion. Eden simply watches life happen; it just so happens that in this case life is often at a rave or disco. The result is certainly meandering. And surely it's not a good thing that after more than two hours of film time and years of story we barely have a sense of Paul's relationship with his artistic partner in deejaying. But de Givry is very compelling, along with Roman Kolinka as an artist friend, and something here has stayed with me a little. Hansen-Love isn't there yet. But the faith shown in her by festivals like NYFF might pay off yet. The new film by the Dardenne brothers is a disappointment. So often, their movies rank among the best of the year and have for nearly 20 years. They've made seven feature films beginning in 1996 and five of them have been great, often really great. Only The Silence of Lorna from 2008 felt like a genuine misfire, with its hokey plot contrivance. They got back on track with 2011's The Kid With A Bike, a movie that seemed to push their signature style into modest new territory with good effect. Two Days, One Night however is a noble failure, a step backward as it seems to recapitulate what they've done before with more elan. Still, it's a timely tale with a strong hook and their fans will surely not feel they've wasted their time by checking it out. Marion Cotillard stars as a woman who has fallen into a serious depression and is now recovered. Or is that recovering? We stay right on top with Sandra as her story quickly reveals itself. She's been on leave from work but the owner of the company forced her coworkers to vote: did they want Sandra to get her job back or receive their annual bonus. The company couldn't afford to do both. After a vote heavily weighted against Sandra, the owner is forced to agree to a new vote. Sandra has the weekend to go visit each of her 16 coworkers and plead for her job... and in the process ask them to give up a 1000 euro bonus. Two Days, One Night has the usual immediacy of a Dardenne film, movies where the camera is usually perched on the shoulder of the protagonist and never leaves their side. But this film soon feels too episodic, too neatly structured in a way. Each coworker has their own psychodrama on display: one is worried about voting against what the owners want because he's on a limited contract, another has been wracked with guilt over voting against Sandra and begs her forgiveness, yet another has a troubled marriage, many try to avoid her and of course they can all use (sometimes desperately) that 1000 euros. Quickly, the meetings between Sandra and her coworkers become too schematic. A happy scene of acceptance is invariably followed by one of rejection or indifference; if one features a poor family, another is sure to feature a family using the bonus for luxuries like a back porch and so on. Some late twists feel cheap and should have bigger ramifications; others give the tale a much-needed substance. No movie by the Dardennes could be without worth and Cotillard is always a pleasure to watch. But this is a minor entry in their filmography and hopefully just a stumble on the way to the next great work by one of the most talented duos in movie history. All ratings out of four stars. Note: Michael Giltz is provided with free access to press screenings with the understanding that he will be writing a review.